JWilliams Staffing is the nation’s #1 recruitment firm specializing in the new home and multi-family industry. We are always open to energetic professionals with knowledge of the real estate and building industry and an entrepreneurial spirit to open a JWS franchise! This unique opportunity to become a business owner is bolstered by the strength of the JWilliams brand industry-wide. JWilliams Staffing has long-standing relationships with national and regional builders as well as property management companies who are always satisfied with our services and know that we provide the best and brightest talent in the industry. Founded in 2003, JWilliams Staffing is owned by real estate industry veteran JoAnne Williams. The Time Is Now – Home & Apartment Builder Confidence is Soaring! The staffing industry generated some $77 billion in revenue: $64 billion from temporary help services and $13 billion in permanent placement services. Real Estate/Home building market has a 5 year pent up demand – Builders are growing again. Confidence among U.S. homebuilders is surging reflecting the biggest gains since 2002 as one of the strongest signs yet the U.S. housing recovery has gained traction. Construction of apartment communities in the last 5 years has added an average of 210,000 new apartment homes per year. Brand Strength – JWilliams Staffing is not only the largest real estate recruitment and staffing firm in the nation, they are also credited with raising the bar in staffing for the industry. National Customer Base – Providing opportunities through national accounts and existing relationships. Turn Key Operation – You will be in business in 30 days after completing training! Creative Business Development - Marketing materials and a national presence through social media and robust web presence. Back Office Support Services (BOSS) – These services include invoicing of clients, payroll processing, payroll tax processing and matching/dispatching candidates to assignments. BOSS help lower your overhead costs – allowing you to pay only for the resources you need. PLUS… Comprehensive 7 Day Training and Full Corporate Support! View JWilliams Staffing Franchise Frequently Asked Questions! View the JWilliams Staffing Franchise Opportunities Page! 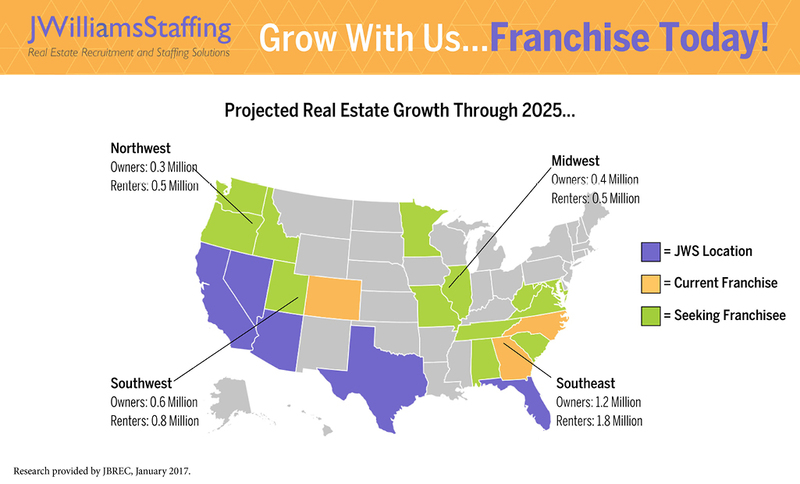 Are You The Next JWilliams Staffing Franchisee? Are you interested in franchise ownership? JWilliams Staffing is looking for qualified candidates to buy into our real estate staffing and recruitment agency franchise. If you believe you would be a good fit for JWilliams Staffing, we want to hear about you! Please fill out the form to the right and we will contact you for more information. Join us and receive the benefits of being part of the nation’s top real estate staffing and recruitment agency!